Sorry for the prolonged absence. I have been, quite literally, out of reach for the last two weeks. In fact, for the entire month of July, I have spent just five days at home. Some if the travel was for work and some for pleasure. 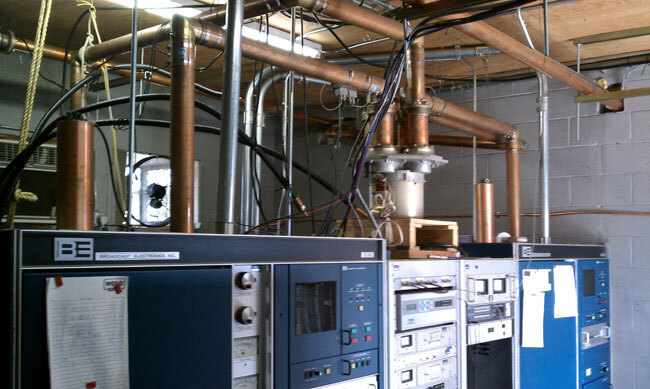 On the work side of the equation, WVPS in Burlington, Vermont has a new Nautel NV-40 transmitter. WVPS is the NPR affiliate for Vermont Public Radio and it’s transmitter site is located on top of Mt. Mansfield, in Stowe, VT. I will do a separate article about the Mt. Mansfield transmitter site because it is an interesting place. WVPS is a Class C FM on 107.9 Mhz. They have one HD subchannel for the VPR classical music format. 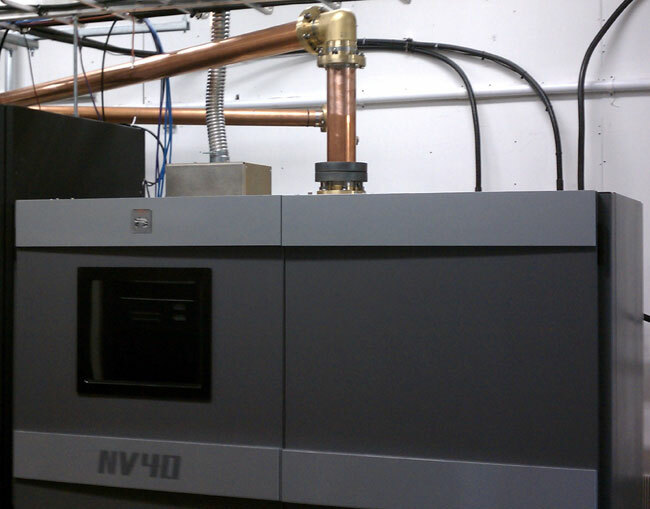 The Nautel NV-40 transmitter is greatly updated from the V-40, which was installed at WHUD. Basically, the V-40 is four ten kilowatt transmitter combined. It is a novel approach and offers quite a bit of redundancy as entire transmitters can be switched off and worked on with the other three remain on the air at full power. 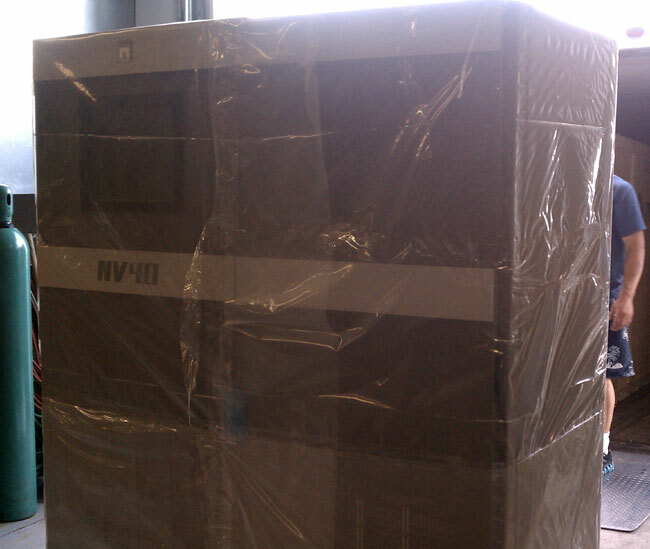 The NV-40 is a single large chassis with internal combining networks. It uses different RF modules but the same power supplies. The entire thing is controlled by a fancy GUI on the front of the transmitter, but also has the ability for manual control if the GUI fails. That is a key feature not seen in other transmitters which simply won’t work without the fancy computer. Other things that I like, the ability to control all of the biasing and other options via the GUI and things like a spectrum analyzer and lissajous display. The ability to look at several graphic displays at once makes it easy to configure and monitor. The transmitter arrived at the top of the mountain via a local moving company. After unloading it on the loading dock, it took some amount of doing to get it down the hall into the transmitter room. 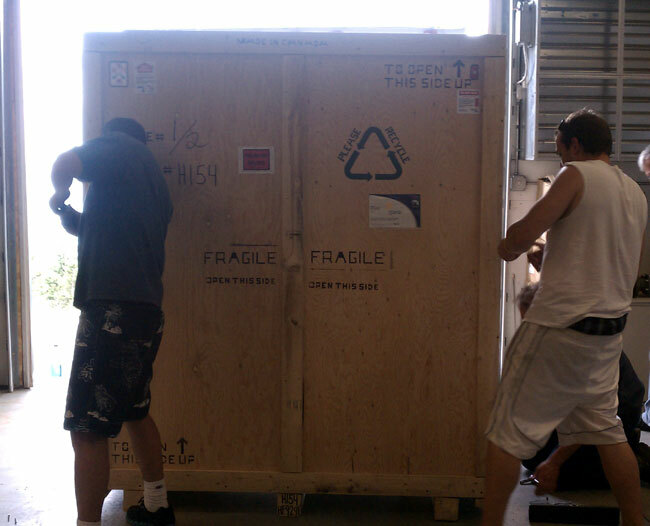 The thing weighs in at 1,600 pounds after being uncrated. Moving into final position in the WVPS transmitter room. 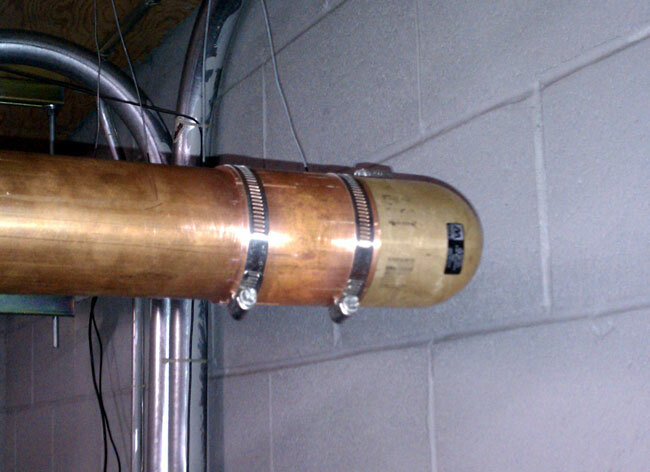 The connections were made to the transmitter, including connecting grounding strap to the back, 200 amp electrical service and the RF output connection via 3 inch rigid coax. The remote control consists of basic transmitter functions going to a dial up Gentner remote control and a Network connection going to the GUI. The network connection allows persons on the network to use a web browser to look at the GUI. The HD radio connections are made via a HD radio importer and exporter, located at the studio, which also uses the network, via a connection on the exciters, to send the HD subchannel. The analog main channel is via an AES/EBU connection from the STL. All connections go through large toroids to help isolate the transmitter from any lightning related surges. Before I left, we tested it at full TPO into the dummy load. All worked well, the only outstanding issue was getting the HD radio importer/exporters to work over the network, which was out of my jurisdiction. 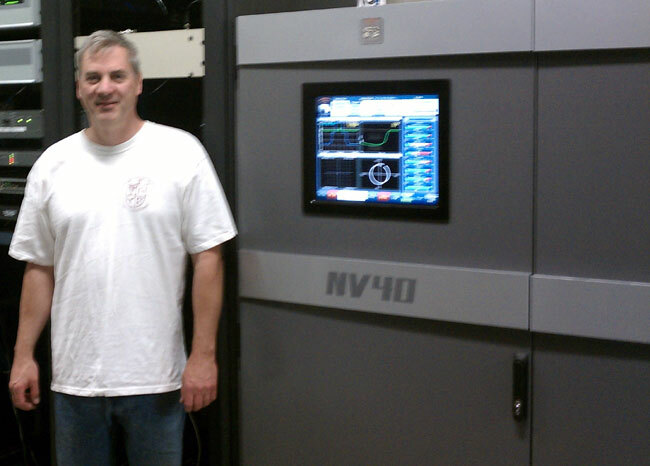 Here is a rather blurry picture of your author standing next to the NV-40 with the exciter and GUI turned on. There are to IEC power connectors at the top of the transmitter that go to the GUI and exciters. This allows those part of the transmitter to run on UPS’s, which is nice, being that the GUI takes about a minute to boot up after power failure. What is "Phasing" as it relates to radio? Occasional reader Jeffery asks a good question, which I will attempt to answer here in simple terms. Phasing, when used with antennas, refers to the relationship that two or more radiating elements share with the waveform being transmitted. 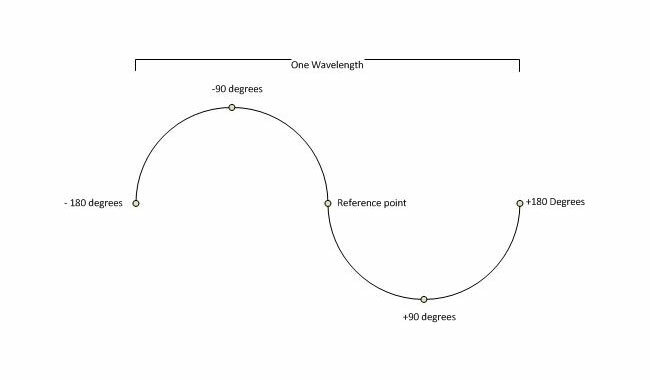 It is used to create an RF radiation pattern by adding energy to the wave front in one direction by taking energy away from the wave front in another direction. In this picture we have two waves being radiated from two separate elements. These elements are spaced 100 degrees apart and tower #2 is phased to +90 degrees. RF generator is coupled to both towers via a power divider, the reference tower (tower #1) is feed with 57% of the power that tower #2 is being feed. Thus, the ratio of power to the respective towers would be 57:42. Thus, if tower one had a power reading of 1.00, tower two would be 0.74. The towers are on a north/south line with the reference tower bearing 180° from tower #2. 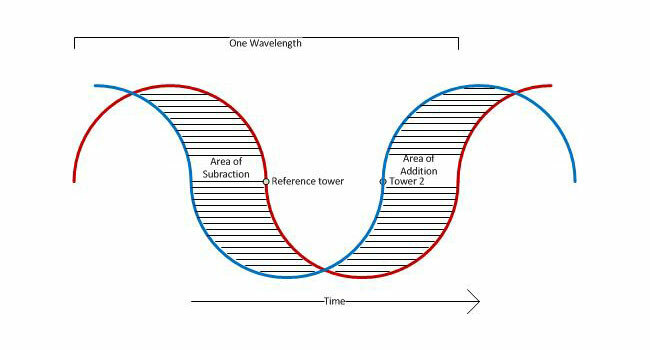 In the area of subtraction, the wave forms from each tower cancel each other out to some radiating less power toward the south; in the area of addition, the wave forms sum to create a more powerful waveform, radiating more power towards the north. This is a typical two tower array, however, there are two slight differences; the reference tower is 215 degrees tall, tower two is 90 degrees tall. This is yet another use of “degrees” to relate electrical length or separations. The second, more notable distinction is that this array is Directional daytime, non-directional night time, which is the opposite of most AM stations in this country. Electrical height can also be described as a function of wave length, e.g. 1/4 wave, 1/2 wave, etc. Most AM towers in this country are 1/4 wave length, which equates to 90 degrees. Often, higher powered stations, and some low powered stations put up towers near 1/2 wave length due to the better ground wave performance of those towers. At lower dial positions, a 1/2 wave tower becomes an expensive proposition due to the height required. In theory, an unlimited number of towers can be used to create a pattern by introducing nulls (areas of subtraction) and lobes (areas of addition). In practice, the highest number of towers I’ve ever heard being used in an AM directional array is twelve; KFXR 1190, Dallas, TX. There may be others, too. 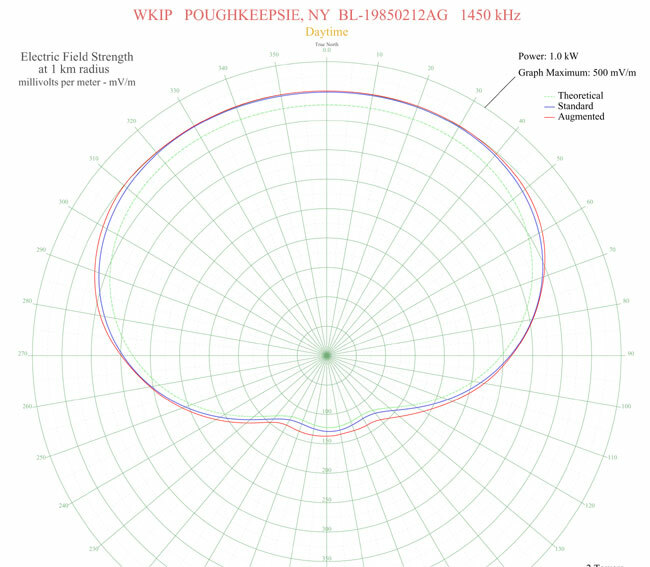 An excellent resource for AM directional antenna technical information is Jack Layton’s Directional Antennas Made Simple, which is out of print but available from various sources. As measured with my Fluke 62 mini IR thermometer, the temperature is 163°F (72.7°C) at the clamp and drops down in both directions. This is at WEBE and this particular section of transmission line is running 34 KW into the analog/digital combiner in the next room. The clamps are tight, but you can see a little scorch mark on the stainless steel clamp right over the slot in the field flange. That is where there is a gap between the outer conductors, which possibly means the inner conductor was cut slightly too long during installation. I suspect this and or a problem with the bullet is causing the heating issue. I was never (and still am not) a fan of those field flange type elbows, I’d much prefer the flanged type with a field flange on the straight line section. 34 KW is getting into the semi-serious power level for FM broadcasting. At those levels, even small impedance mismatches can lead to big problems. We have a new elbow, field flanges, bullets on order. Unfortunately, we will have to take the station off the air to replace this. This is all a part of an air conditioning project. There was a plywood partition wall between the front and the back of the transmitters which was impeding air flow. All of the HVAC contractors who bid on the AC job identified it as an problem which needed to be addressed before the big 5 ton wall mount AC units were installed. Update: Replaced elbow last night (8/4). Went off at 10pm and back on at 10:25. Found the inner conductor had been pushed out of place and was off center on the outside (toward the wall side) of the elbow. This was an older elbow that did not have the nylon inner spacers on the center conductor. The inner conductor was dark purple. 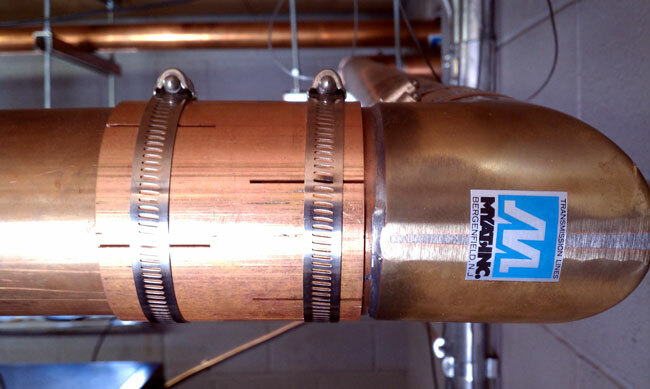 Before replacement, the elbow was 138°F (59°C) under full power (34 KW). After replacement, it was 97°F (36°C) as was the rest of the transmission line. At these power levels and frequencies, even small, minor imperfections cause impedance shifts and become issues. I cleaned up and reused the bullets and the outer conductor with scotch brite. I also used more support wires because I believe the elbow was starting to pull apart, which can sort of be seen in the first picture.